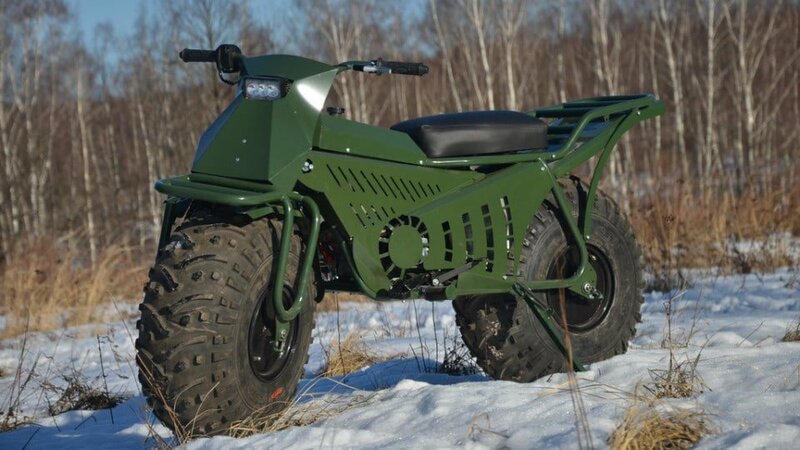 The Russian built Taurus is a two-wheel drive all terrain motorcycle. It’s probably one of the ugliest motorcycles we’ve ever seen, but the Russian built Taurus 2×2 is the motorcycle world’s answer to the four wheel drive. It’s super-small, ultra-light, 2 wheel drive and folds up to fit in the boot of your car! The Taurus isn’t going to set your heart racing with amazing performance, but it can take you into places you could never get to, even on many mainstream off-road bikes. The bike is powered by a 210cc four-stroke Honda engine (with a pull starter) that generates only around 5 kW and reportedly can reach speeds of 35 km/h. It weighs in at just 89 kg dry. It runs massive tyres that help the bike cross obstacles like rocks and to get through even deep mud and snow. A single screw unlocks the patented front forks so they can be removed. The handlebars, seat, rear sub-frame and wheels can also be removed and the whole bike fitted into the back of a car. And apparently it can all be done in just 5 minutes. The Russian manufacturer says the Taurus is well suited to people who love hunting, fishing, tourism, travel and active recreations. The bike is produced in a factory south of Moscow and is only for sale in Russia at the moment, although the manufacturer says they are hoping to begin exports to other countries soon.